Mix and Chic: Holiday tips for a beautiful home! As the holidays are fast approaching, it's time to think about decorating and cleaning to make our homes sparkle and shine for the holiday season! #BonaHolidayShine This year, my in-laws will be visiting for the holidays so there's the extra pressure to make my home looks beautiful and presentable! Here are some of my tips to create a beautiful home for the holiday season! Consider getting preserved plants or faux plants. Bringing in live plants and greeneries is a great way to add freshness and tranquility to an environment. However, if you live in a home that doesn't receive a lot of natural light, getting faux plants or preserved foliages is another great option to enhance the beauty of your home. Since our home lacks natural lighting, I love using preserved boxwood topiaries and faux mini pine trees as part of my holiday decor. Preserved plants and faux plants are usually inexpensive, low maintenance, lost-lasting and best of all, you can put them anywhere you like, what's not to love? Put one on your nightstand, fireplace mantle, desk, dining table, shelf, kitchen counter, bathroom, the possibilities are really endless! A thoughtfully-styled vignette instantly add warmth, beauty, charm and visual interest in a room. To achieve a beautiful vignette, select objects with varying heights, textures and sizes for a collected, layered look. Move things around and switch things up until you achieve the look you desired. Experimenting and editing are key to a create a balanced, well-styled vignette. There are many areas where you can create a vignette such as on top of a console table, coffee table, dining table, nightstand, fireplace mantel, wall shelf, bookshelf, kitchen island, above the kitchen cabinet, above an armoire, etc. During the holiday season, try incorporating some holiday baubles and sparkly decor in your vignettes to bring out a cheerful and inviting festive mood! Look for unexpected and interesting details. Look for pieces with unexpected or interesting details when you are shopping for holiday decor. When I was shopping for a table runner for the holidays last year, I picked one with a beautiful and unexpected detail on the sides rather than a regular runner with a continuous pattern. An unconventional design element in a piece makes your decor much more special, memorable and delightful. Have a cohesive color scheme. When I decorate for the holidays, I love using the classic red and green color palette because it looks vibrant and feels festive at the same time. I try to incorporate the same color scheme throughout the house for a cohesive design and pulled-together look. Make your home sparkle and shine! To make your home truly inviting and beautiful to welcome the holiday season, don't forget to make your floors sparkle and shine. 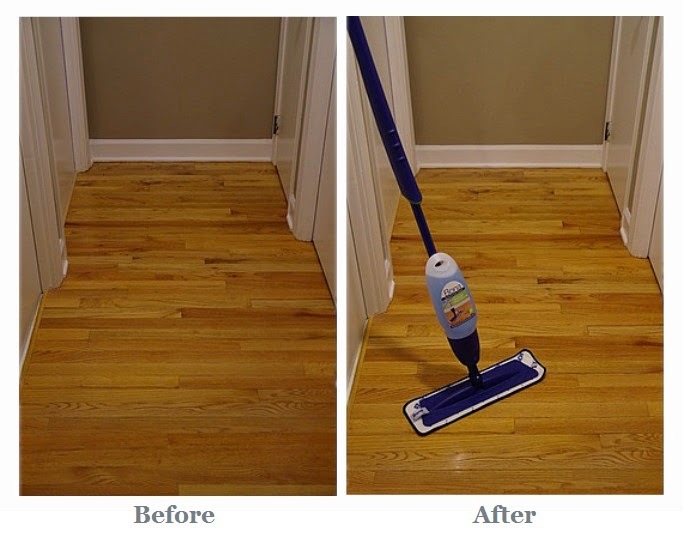 I was recently introduced to Bona hardwood floor mop and it worked like a charm making my floors squeaky clean and extra shiny! Here's my new Bona Hardwood Floor Mop. Close-up of my fabulous new floor mop! 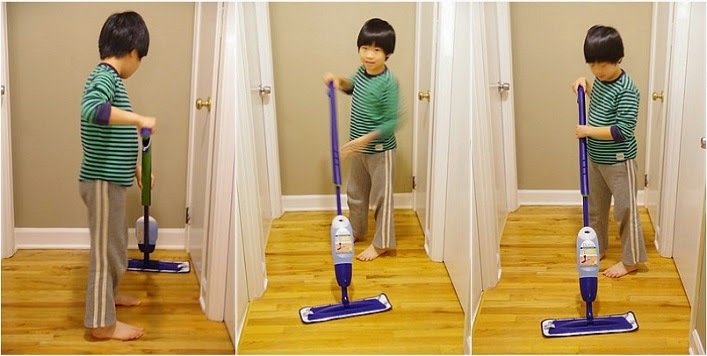 What I like most about my Bona Hardwood Floor mop! 1. It is really easy to use, simply squeeze the handle and the Bona Cleaner is sprayed onto your floor. 3. It dries fast and won't leave any residue behind. 4. The Bona Hardwood Floor Cleaner is non-toxic, GREENGUARD certified to be safe and effective. Even my little one was getting into the cleaning action! Here's what my floor looked like after I mopped it using my Bona hardwood floor mop. See the huge difference on my hardwood floors? I used to clean my hardwood floors with vinegar and water, it cleans well but it leaves my floor dull and unattractive over time due to the acidy content. Bona Hardwood Floor Cleaner on the other hand has a pH-neutral solution and leaves my hardwood floors perfectly beautiful and shiny! If you like to give this product a try, don't forget to join the BonaFide Fanatics mailing list to receive an instant $3 off coupon for a Bona hardwood floor cleaner! I hope you find my tips useful to help make your home beautiful, sparkle and shine for the upcoming holiday season! Disclosure: Thank you to Bona for sponsoring today’s post and inspiring me to try this amazing solution for sparkling floors! Love all your decorations Jessie! Are those this years'? I haven't tried bona, but now I'm tempted to!